Ladies Floral Next Dress With Keyhole Lace Detail On Neck. Size 10. Condition is Used. Dispatched with Royal Mail 2nd Class. Due to the quality differentiation between different monitors, the picture may not reflect the actual colour of the item. Colour: Orange red. Our primary desire is to make your clothes fit you. We put all our hearts in helping you to reach it. This is a lovely and comfortable dress by H&M in a size 14 although small sizing so would best suit a 10 or 12. The dress is a white tunic pull on style with a black feather print across the fabric. The neckline and is round and to the back there is a keyhole notch and two fabric ties to tie at the neckline. This dress looks great teamed with an oversized cardigan and boots. This dress is in a good pre-loved condition with so much wear left to be had. I’m sure you will look wonderful in this dress :) If you have any questions about this item then do please ask as I am happy to help. Also be sure to take a look at the other items I have for sale as some will be of a similar style which you may like too :) *all my items come from a smoke and pet free home. 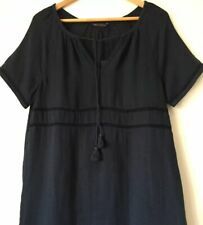 JUNAROSE navy blue textured tunic dress with keyhole back (see pic 5). Dress has pockets. 100% polyester. The front of the dress has a centre vertical seam to the waist where there is a shaped horizontal seam with hidden pockets each side,the back has a centre vertical seam from under the keyhole. Bright red A line shift dress which has a orange red look, slight textured stretch good quality fabric. Lipsy Stunning Floral Satin Shift Dress Sz 10 (small fitting) Keyhole back fastening. Measured flat pit to pit approx 17.5ins. Please take a look at my other items. All used clothing is freshly laundered. As I try to describe my items as accurately as possible I'm afraid no refunds or returns however if you have a problem then please contact me. Proof of postage is obtained for all items. Thanks for looking! Stunning Next embroidered dress. Evening /special occasion / romantic. Pit to Pit = 40 cm. Shoulder to Hem = 102 cm. Fabulous clean and tidy preloved condition with no rips or marks. No sizing, care or fabric information on the garment. Stunning M&S Collection Petite Floral pale blue multi floral skater fit and flare dress. Keyhole back. Button and zip back fastening. displayed on a size 8-10 mannequin. I’ve advertised as suitable for an 8/10 but please check measurements prior to ordering as no size information present. Approximately 36” across the armpits flat and 34” shoulder to hem. Waist 30”. From a clean and smoke free home. Please pay by PayPal within 48 hours. I always obtain proof of postage. I'm having a huge clear out. Please check my other listings. Any questions, fire away. BNWT NEXT DAISY PRINT DRESS. BLACK & PINK Daisy Like Flowers on WHITE Background. Size 10 Petite. Length from Nape to Hem approx 35.5ins. Loose, knee length. satin feel material with stretch. Floral Patterned. Blue Red Shift Dress. Shoulder to Shoulder 80 31.2. UK Size 12. Back Buttons Fastening. Beautiful Bright Floral dress by Marks and Spencer. The dress has a couple of pulls at the back - see photo, hardly noticeable and they certainly don't detract from the gorgeous bright print. A really lovely flattering red Jolie Moi dress size 14. This is a beautiful semi fitted dress made in a heavy cotton fabric. The high waistline gives shape and is very flattering. A stunning red colour with a black edging, suitable for office or dinner out, and great for any special social occasion. Ladies Navy Blue Lace Overlay Sample Dress. Lined - fully, leaving around 3” at the bottom to show the beautiful lace detail. 3/4 lace sleeves. You can see the usual style. Size 12 - shown worn on my size 10/12 mannequin. This is truly beautiful for the upcoming autumn months ahead. A beautiful rustic red/burnt orange with fabulous autumn leaves in various autumn colours. Grab a fantastic bargain. Lovely thick cotton with a nice textured effect.